Marcel Boucher’s work falls under many titles and names, such as Marboux, Cartier, Mazer, Avon of Belleville. He was a prolific designer of costume jewelry and his names signify quality materials and craftsmanship. There is great information on the Internet about Marcel Boucher, including short biographies. Marcel Boucher was born in Paris, France in 1898. His father died when he was very young and raised by a single mother, who made her living as a seamstress. During the First World War, Boucher volunteered for the Ambulanciers Corps Français, because he was the only son of a widow and would not have been sent to the front lines in the Army. When the War ended, Boucher went to work for Cartier. Already a long established company of fine jewellery makers, Boucher worked as a mold-maker and apprentice. During the early 1920s, he learned is craft from Pierre Cartier and moved to New York to continue his practice and education. When the depression hit the United States in the late 20s, Boucher was out of work. He began freelancing and designing Show buckles. He later began working for Mazer brothers. And in 1937, he opened his own company with a partner, Arthur Halbersatdt, who worked sales and the showroom. They called the company; Marcel Boucher and Cie. In 1936, Boucher designed his first line of costume jewelry and in 1939, sold a collection of his designs to the New York City store Saks Fifth Avenue. From 1941 to 1945 he lived and worked in Mexico City. In 1949, Sandra Semensohn joined the Boucher Company as Boucher’s assistant replacing Halberstadt who had decided to leave the partnership. Boucher designed the Marboux line in the early 1960s, which was less expensive and of lesser quality. In October 1964, Sandra and Marcel were married. Six weeks later, Marcel Boucher died. Boucher left his business to his wife Sandra. She continued to run Boucher and Cie, but Sandra was a designer, not a businesswoman. She eventually sold the business to Davorn Industries in 1970. Sandra designed watches for Davorn for the next 5 years and continued to mark them “Marcel Boucher” even after the sale of Boucher and Cie. In 1979, the company was sold to D’Orlan Industries of Toronto, Canada. The workmanship and details on the jewelry now being produced from the Boucher molds by D’Orlan is of high quality but does not measure up to the older pieces produced by Marcel Boucher. The jewelry pieces have a design inventory number and are now signed “D’Orlan“. D’Orlan legitimately reproduces many of Boucher’s jewels. Their jewels are marked D’Orlan with Boucher’s design inventory number because they use Boucher’s original molds. Jewelry by Boucher is almost always signed (meaning a marking signifying authenticity was put on the piece) and has an inventory number on it somewhere. Some of the earliest marks say “Marboux” or “MB” or “Boucher”. If a hundred pieces were created in 1945 they would have any series of the following numbers 2300-2350 imprinted on the back of the piece of jewelry, as well as the name. Marks with the copyright symbol © are after 1955. It is also said that in the late 60’s or early 70’s the Boucher numbering system started over after it hit 9999. Signatures used: MB with or without the Phrygian cap, Boucher and Marcel Boucher. The Marboux mark,written in cursive and preceded by one star, was recorded in 1955 as the name of a new line, at a low cost of $1-$5, for tailored jewelry. Parisina mark on Sterling made in Mexico during WW2. Some of the later pieces that are parts of sets have the number and “P” for Pin, “E” for Earring or “N” for Necklace. AVON of BELLEVILLE: Much of AVON of BELLEVILLE jewelry was designed by Boucher and although having the AVON of BELLEVILLE signature also has Boucher’s signature 4-digit design numbers. Boucher used to visit his mother in Canada because she emigrated to Montreal, Quebec. Gold plating enamel was used with 3-dimensional designs using the 4 precious stone colors on jewelry of exotic birds, insects, and flowers. Imitation diamond (beautiful rhinestones), ruby, sapphire and emerald stones, and simulated pearls. 1930s-Boucher’s love of mechanics extended to his jewelry designs, by adding dimension and a sense of motion to the flat jewelry. Also worth mentioning is his celebrated “Punchinello” whose arms rise by pulling on a chain; the pelican whose beak opens to catch a fish; and his “night and day” series of flowers with petals which open and close. 1940s -Parisianna Mexican Silver jewelry line is highly prized and sought after by collectors. 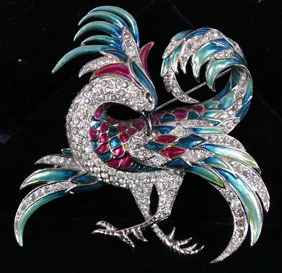 Also very collectible is the jewelry group of “Exotic Birds”. 1940s- Produced an extraordinary variety of designs including an exceptional line in cubist style, a striking black moor head and a beautiful bird-of-paradise design. Immediately after the war he was forced to sue Coro to stop them pirating his designs, but it was an expensive victory as the damages awarded was $35,000 but the attorney’s fees cost $50,000. One solution he found was to have the cabochon stones made exclusively for Boucher in non-standard sizes. 1950s -Boucher had adopted a more traditional look heavily influenced by contemporary trends in precious jewelry, designs with animal pins, buckle motifs, and leaf-themed rhinestone parures from the 1950s and 1960s are common. Ostrich and mother-of-pearl jewelry. Boucher also designed a series of dogs with his habitual attention to detail. The only freelance design produced during this time was the skunk, which Marcel and the Neiman Marcus buyer both favoured.